Royo Bordonada MA, Armario P, Lobos Bejarano JM, Pedro Botet J, Villar Álvarez F, Elosua R, et al. Spanish adaptation of the 2016 European guidelines on cardiovascular disease prevention in clinical practice. Rev Pediatr Aten Primaria. 2017;19:e1-e25. Conejo Fernández A, Martínez Roig A, Ramírez Balza O, Álvez González F, Hernández Hernández A, Baquero Artigao F, et al. SEIP-AEPap-SEPEAP consensus document on the etiology, diagnosis, treatment and ambulatory management of fungal skin infections. Rev Pediatr Aten Primaria. 2016;18:e149-e172. Moreno Pérez D, García Sánchez N, Arístegui Fernández J, Ruiz Contreras J, Álvarez García FJ, Hernández Merino A, et al. Seasonal influenza vaccination in children and adolescents. Recommendations of the Vaccine Advisory Committee of the Spanish Society of Paediatrics for the 2016-2017 campaign. Rev Pediatr Aten Primaria. 2016;18:e173-e197. Roca Saumell C, Soriano Arandes A, Solsona Díaz L, Gascón Brustenga J, Grupo de consenso Chagas-APS. Consensus document for the detection and management of Chagas disease in Primary Health Care in non-endemic areas. Rev Pediatr Aten Primaria. 2015;17:e1-e12. Lobos Bejarano JM, Galve E, Royo Bordonada MA, Alegría Ezquerra E, Armario P, Brotons Cuixart C, et al. 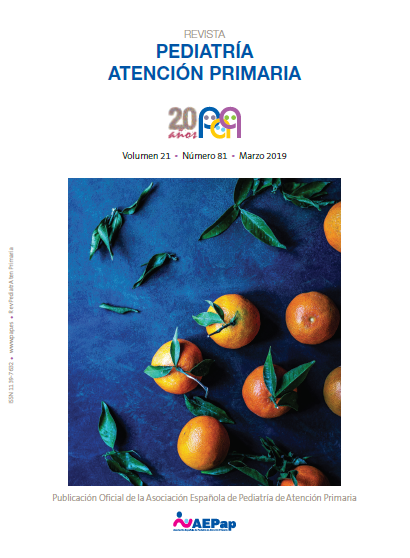 Spanish Interdisciplinary Committee for Cardiovascular Disease Prevention and the Spanish Society of Cardiology Position Statement on Dyslipidemia Management. Differences Between the European and American Guidelines. Rev Pediatr Aten Primaria. 2014;16:e161-e172. Gil A, Barranco D, Batalla J, Bayas JM, Campins M, Gorrotxategi Gorrotxategi P, et al. Prevention of serogroup B meningococcal disease using a four-component vaccine. Rev Pediatr Aten Primaria. 2014;16:108.e55-e74. Moreno Pérez D, Álvarez García FJ, Arístegui Fernández J, Cilleruelo Ortega MJ, Corretger Rauet JM, García Sánchez N, et al. Immunisation schedule of the Spanish Association of Paediatrics: 2014 recommendations. Rev Pediatr Aten Primaria. 2014;16:13-20.
del Castillo Martín F, Baquero Artigao F, de la Calle Cabrera T, López Robles MV, Ruiz Canela J, Alfayate Miguélez S, et al. Consensus document on the aetiology, diagnosis and treatment of acute otitis media. Rev Pediatr Aten Primaria. 2012;14:195-205.